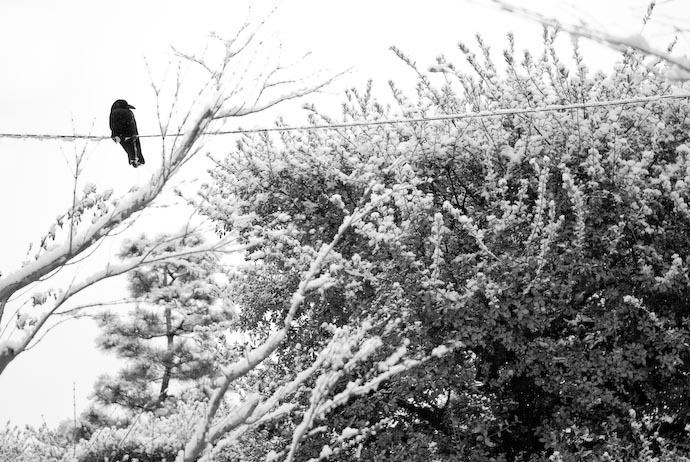 Jeffrey Friedl's Blog » Crow and Snowy Trees: Is This Photo Interesting? Crow and Snowy Trees: Is This Photo Interesting? Is this shot at all interesting? We awoke to a pretty layer of snow this morning, and I'm now going through the 249 shots I took on a short outing with Anthony. I was about to add this shot to the reject pile when I had second thoughts. I converted it to grayscale, futzed with the grayscale mix in Lightroom, and now it has some appeal to me, although I can't put my finger on exactly what. Maybe the grayscale makes it interesting? I had a grayscale shot on my Artsy-Fartsy in Kyoto af f/1.2 post, which was met with overwhelming silence, so maybe I'm off track. Anyway, I probably should just go with my first impression. It is interesting to me. It looks as though it is a drawing more than a photograph. Except for a few bits poking in on the left and the large out of focus branch on the right, I think it all works very well. Very nice. What bits poking out on the left? I probably framed the out-of-focus branch on the right on purpose, to add some depth. I agree that in the end, it’s distracting. I think the bird on the snowy wire is interesting enough to warrant a closer shot of just the bird and the wire, perhaps with just a few snowy twigs (in focus ones) around one or two of the frame edges to give context. Is it interesting? In a word: yes. The bird is the only solid-seeming presence in what looks like a fluffy, cotton-wool world, a black-and-white bird in a grayscale picture. Definitely interesting and well seen. I think I go along with Jon’s comment: how about a narrow vertical crop to include the pine tree in the background – about a third, or even less, of the present image width? The minimalist effect resulting puts me in mind of Imao Keinen’s Kachou Gafu, outstanding “flower and bird” woodcuts from the end of the 19th century. Pity it’s not your tame heron, or you could perhaps persuade it to pose again for you! Yes, that’s exactly it, I also thought of sumi-e ink paintings when I saw the bird and branches.